Have you ever considered crating your dog but thought, “No, that’s too cruel”? 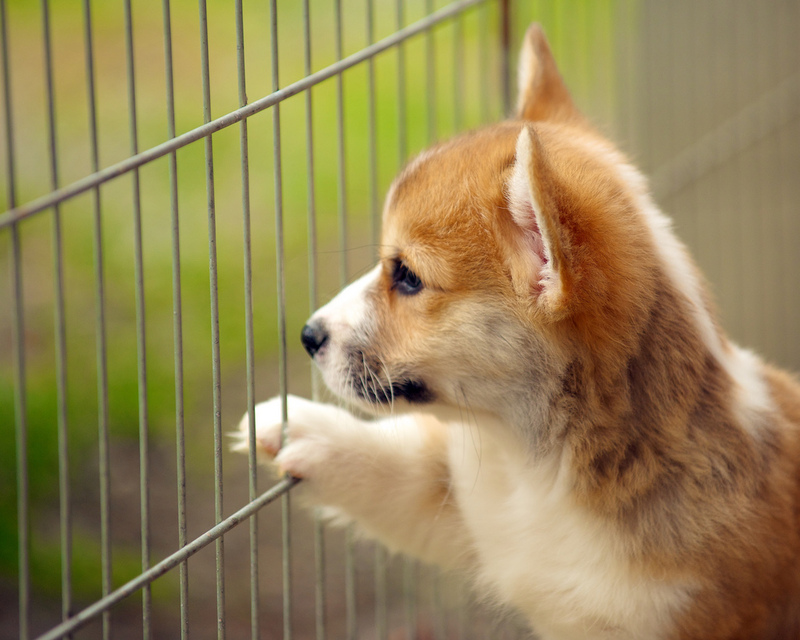 There sometimes can be confusion surrounding the idea of crate training a dog. If used in the right manner, crating your dog can actually create a private, safe space for your pet to go when he is anxious, overwhelmed or tired. According to Best Friends Pet Care, dogs are actually den animals and appreciate having a safe haven to retreat to. Crates, they argue, are similar to your puppy lying underneath a table or in another small, covered space. *Please note: Crates can be used in an abusive manner if your dog is left in there all day with no exercise, bathroom breaks or eating times while you are at work or away for the day. While this kind of behavior is neglectful, we argue that the proper use of crates can be beneficial to both you and your dog. This may sound like it’s more for your benefit than your dog’s, but actually, using a crate provides a clean, unsoiled rest spot for your pet. According to Sarah Fulcher from Clicker Training, dogs don’t want to lay in the messes they’ve made, so they typically refrain from using their crate as the great outdoors or other acceptable bathroom mat. This can be an extremely useful tool while potty training. Use the crate as a mess-free area while you are away so your dog doesn’t relieve himself on your carpet. If you have a puppy that is still into the habit of nibbling on new shoes or chewing the couch, you might consider using a crate at night or while you are out of the house to keep your furry friend from getting into any trouble. Once a dog is accustomed to his crate, he will sometimes go there to relax. Instead of worrying about your brand new chair turning into Fido’s new chew toy, you can provide a crate to relax your pooch and protect your valuables. As mentioned above, creates can be a safe haven – a den of sorts – that give your dog the quiet time he needs, especially if he is anxious or excitable by nature. According to Fulcher, you can turn your dog’s crate into a fun place and give him a Kong filled with peanut butter or some other type of mental stimulation to keep him occupied, happy and out of trouble. What Crate Should You Get? Maybe you’ve determined getting a crate is the right option for your pup. Now what? There are a variety of crates you can choose from, including wire, plastic and felt crates. Fulcher suggests that the felt crates are most suitable for travel, but not for long-term use in the house. Wire and plastic crates provide more physical stability. If you choose a wire crate but think your dog needs more privacy, you can always place a blanket over it. It is recommended that a dog’s crate should be big enough for him to stand up, lie down and turn around in. If it is any bigger, especially before your pup is potty trained, there may be a temptation for him to use a portion of the crate as a bathroom mat. Picking a crate that is just the right size also reinforces the idea that your dog is in a small, private space that is just his. We hope you gleaned a few tips about crating your pooch and can also answer the questions, “Is crating my dog cruel?” with a no. Thanks for stopping by. If you are away on a trip and need someone to watch your pooch so he is not in a crate all day, give Cane Bay a call at 843-879-0822. 4 hours is the limit for adults and 1 half hour for puppies awake time. I thought it was so interesting that crating my dog could help with potty training my dog. I will consider using this suggestion as I try to train my dog. That way I can leave my dog with a dog sitter when I got on vacation!